With so many physical and hormonal changes occurring in your body throughout the pre and post-natal period it is not unusual to experience pain at some point. Indeed it is so common to be in pain during pregnancy that it can be accepted as normal. This should not need to be the case! The mechanical stresses experienced by your changing body can result in painful conditions, commonly low back pain, sciatic pain, pelvic pain and SPD (Symphysis Pubis Dysfunction) but injury can occur anywhere in the body. While after the birth it is more common to suffer upper back and neck pain resulting from breast feeding and carrying your little one around. Osteopathy is a gentle safe, non-invasive manual therapy that using hands on techniques to diagnose and treat musculoskeletal conditions which occur both pre and postnatally. Therapeutic massage is used to promote the feeling of overall well-being that is especially important during pregnancy. Pregnancy massage is a gentle soft tissue technique carried out with the patient in a comfortable side lying position avoiding putting stress on the abdomen and uterine ligaments. It aims to reduce aches, pains, muscle tension, swelling and anxiety, while enhancing circulation, improving sleep and promoting health. Our pregnancy massage therapists are trained to work with pregnant women and are certified in prenatal massage. We do not treat in the 1st trimester or week 16 because of the increased risk for miscarriage during the first 12 weeks of pregnancy. If you have a high risk pregnancy, pre-eclamsia, pregnancy induced hypertension, previous pre-term labour, then speak to your healthcare provider before booking an appointment. 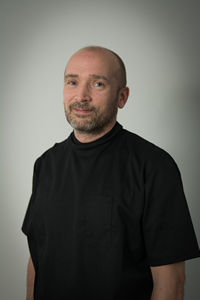 Meet Rhodri, Rhodri is also fully qualified in pregnancy massage, focusing on providing comfortable and effective treatments aimed at soothing and relaxing sore muscles, improving circulation and mobility to meet the needs of mother and baby. Working with pregnant patients can be really challenging but incredibly rewarding as it is such an exciting time in someone’s life. Having regularly worked with and spoken to expectant mothers I have noticed that there can be a belief that aches and pains are an expected part of being pregnant but this does not have to be the case. Pregnancy doesn’t have to be painful!!! Common maladies that patients complain of are low back pain, sciatica, upper back and rib pain, pelvic girdle pain, swollen hands and feet and many more. The good news is that we can do a lot to help remedy these issues with manual therapy, education and exercise. I did my first specific pregnancy massage course in 2014 focusing on working safely with pregnant patients and adapting massage techniques and positions for a pregnant client. My interest continued when Aimee was pregnant with my little boy Thomas and it was then I decided that it would be a good idea to learn more about pregnancy. I completed a post graduate course in Osteopathic Treatment of the expectant mother with Osteopath and Midwife Helen Robinson which focused on the anatomy and physiology of pregnancy and the changes that occur during the three trimesters, pre-natal conditions and treatment approaches. Having a greater understanding of the pre-natal process really helped us as Aimee’s pregnancy developed and meant that I was able to help her have a comfortable pregnancy.